The PAVE organization (Planning And Visual Education) hosts a student design competition every year that is centered around retail design. The competition was sponsored in 2016 by Kroger, the largest grocery chain in the United States. The prompt was to redesign the health and wellness sections of the store which includes the Pharmacy, the Little Clinic, and the shopping sections of beauty, personal care products and medicines. I started with the trend forecast What the Well? (HERE) that analyzed current attitudes towards health and wellness. It was clear to me that this area had to be centered around helping and educating customers on the topic so I also studied customer archetypes to help inform my design solution. PERSONAL INSIGHT: From my trend analysis I developed a system of three elements, Discover, Educate, Empower that are interconnected and cater to customers. The goal is to give customers the resources they need to define and achieve their own, personal definitions of wellness. Wellness is subjective. 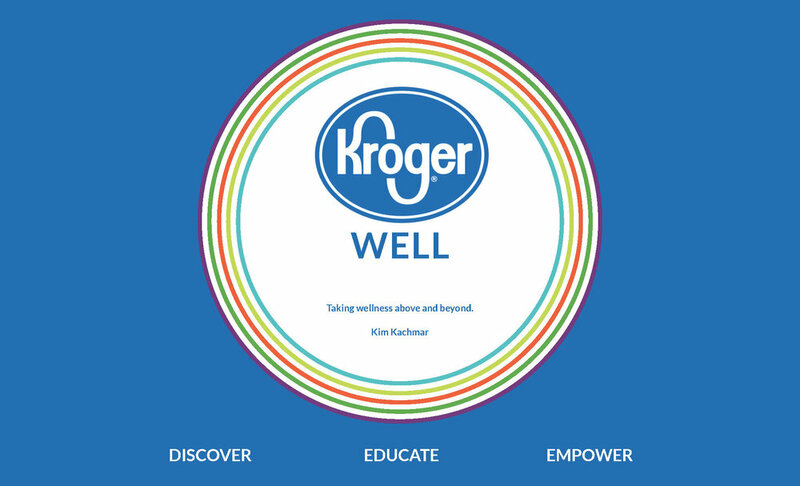 I wanted to position Kroger as an intermediary between the customer and wellness because one prescriptive method can not fit the various needs of the customers. The PAVE competition deadline was in early November but my school semester went until December so I worked on other parts of the Kroger store where I saw a need. From my many visits to the store I noticed that the flower section at the entry was small and didn't capitalize on health and wellness the way that it should. I worked on a design for the entrance that included a more aesthetically pleasing plant section that kept with the theme of Discover, Educate, and Empower. I also further developed the Simple Truth Market I conceived of in the initial PAVE submission. I started by assessing the existing Kroger store and Total Health floorplans. I analyzed customer flow and the adjacencies of the retail sections. I sketched out a lot of ideas before settling on something that had a vaguely circular flow. I landed on this idea because I wanted shopping in this section to feel open, soft, and not intimidating because the concept was about making customers realize that their wellness goals are achievable. The circular flow of the plan directly influenced the design of the Discover areas as I started to iterate what they could look like. The two discover areas, one for beauty and personal care products and another for the over-the-counter medicine, had to have fixtures that displayed new Kroger health and wellness information and products. For the entry I focused on creating a greenhouse to incorporate the plants. The focus of the Simple Truth Market was the fixtures and I tested different heights and ways of displaying product. This was the first totally individual project I worked on in university and it really tested me. I took on new types of design like creating the graphics for this system and it was a good exercise for me. I learned the most about how to take my research findings on customers and translate that into the design of a physical space. Studying the pervasive idea of health and wellness was also interesting because it has become a lifestyle that we will continue to build our lives upon.